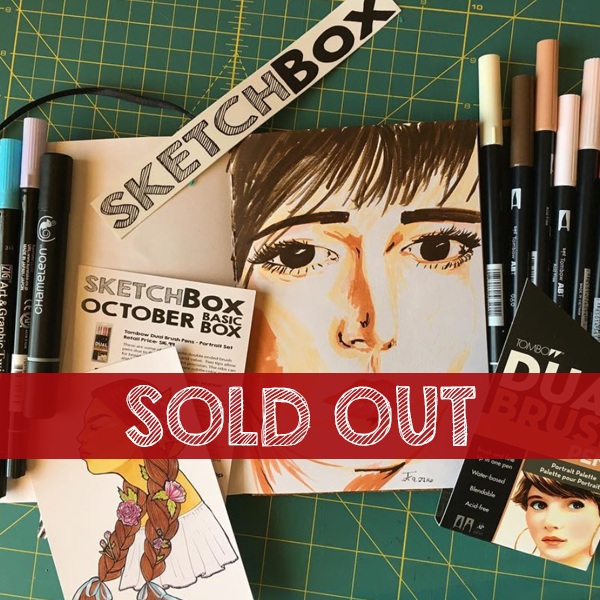 Our October 2016 Basic box included a full 6 piece portrait set of Tombow dual brush pens. These markers include a flexible brush nib and a bullet tip for more precise line work. We also included 2 Zig Art & Graphic twin markers. Zig Art & Graphic Twin Markers are filled with a water based dye that is odorless and xylene-free. The flexible rubber brush tip creates a variety of line and stroke sizes, while maintaining its spring and shape without fraying. The fine-point (0.8 mm) fiber tip is ideal for detail work, sketching, or finishing touches. Finally we included a Chameleon detail pen. The ink is compatible with alcohol and water based inks and will not smear. It's double-ended with two Fine Line nibs (0.6mm and 0.4mm), perfect for outlining your work or adding finer details. This picture was taken by our subscriber @afritz55 on instagram.